FABRIC THERAPY - some people take pills to keep them sane...I take 100% cotton. This is my new hand stitching companion...literally a THREAD CATCHER. When I am hand stitching, there are little tails of silk thread and snippets of quilting cotton EVERYWHERE...I know things are out of hand when Weasley the cat saunters by with thread and fabric snippets are stuck to his fur coat! When I take a pause from stitching, I simply push all my little thread tails to the bottom of the container, hold the rim, and twist the bottom compactly into the rim...ta da!! The threads are trapped within the compact, little, twisted container. SO neat and tidy! I discovered a great video on how to do this on Pinterest, which I will link at the end of this post, but I found that some of the measurements needed to be updated to make it actually come out right...like toilet paper rolls, and so many other things, packaging/product is shrinking while prices stay the same or increase. After gobbling up all the Pringles, wipe the tube (and your clothing) free of crumbs, cut off the lip of the container, and cut a 1/2" slice of the tube. I used paper scissors, but a nice sharp craft knife might be easier. The size of the components for the thread catcher bottom are dependent on the size of the Pringles ring. The box board and batting circles need to be slightly smaller in diameter so that, once covered in fabric, they won't be too tight to to twist, push, and nestle inside the Pringles ring. I found this inside size/diameter to be about 2-11/16"...just shy of 2-3/4". Cut two each of the box board and the batting. Then I made my two fabric circles a little larger so that I would have room to baste and gather the edges around the box board and batting. My fabric circles measured 3-1/2" in diameter. ...followed by a box board circle, covering the batting circle. Then I pull the gathering thread to surround my batting and box board circles. I secure this with a couple of stitches and a knot. Then, I fold my fabric rectangle, right sides together, and stitch along the SHORT side with a 1/4" seam allowance. Note that the stitching is on the 8" edge of the fabric rectangle. Now I press the seam open so that it will lie nice and flat. With right sides still together, I slide my Pringles ring on my tube of fabric and encase the ring as I bring the edges that are pressed under together. I line up those pressed under edges and pin. My Pringles ring is now securely located where the fabric tube folds. I stitch right under the Pringles ring to lock it in a casing. Then I remove my pins. I push the inside of the fabric tube out past the Pringles ring. See how my 1/4" seam is still neatly turned under? I insert my thread catcher bottom and secure with pins. The fabric tube will be slightly larger, so you will have to center the bottom as you pin to ease the slight fullness. Then I slip stitch around, easing the fullness and removing pins as I stitch. Then I push the bottom through the ring, and into the other open end with the pressed under edge, center, pin, and slip stitch in the same way. ...and gently twist and collapse, trapping the thread tails. SO easy and satisfying. And it is so compact and small that it will fit nicely in my stitching bag. Here is a the video I found on Pinterest. She really lays out the steps very nicely. Note: I found my set of Karen Kaye Buckley large circles very helpful...there is one exactly the size of the fabric circle, and I used another to make my box board/batting template and just trimmed my template a little smaller. Sure beats an old WalMart plastic bag! Thanks for sharing the details. OH-MY-GAWSH that is just too cute. I'm going to run out for some Pringles this afternoon and get one made. Your pictures are really clear. I have my first time reatreat in 2 months, I completely need that ! Great idea! Your step by steps made it clear and do-able! BTW your catcher is much cuter than the one of the video! This is so cute! Wonderful fabric and pictures showing how to make this. Well done! Thankyou Teresa ! Great tutorial. I made one of these using the inside of a 3 inch embroidery hoop. I like your pringle's tube better. OH LOVE THIS! Thank you so much for sharing...........what fabulous gifts these would make! I can't wait to make this but first a trip to the store is in order. Thanks to you and Angie. I read earlier that you will be moving. I wish you well as you face these new challenges in your life. I trust there will be some sewing to help you transition so I hope you'll have a chance to post occasionally so we can follow your progress. You and your famiy will be remembered in my prayers. Your tutorial is a great help in understanding how this goes together. What a handy tool! Thanks for sharing...that is so cute! very nice! Think I need to drink another cup of coffee before I try this at home! Oh my goodness Teresa, I love this and will have to make one. Thank you for sharing! so simple yet so sweet! Thanks for sharing. I Love it! Thanks for sharing. I love that it is smaller than what I usually use for a thread catcher. Oh, my, gosh, Teresa, this is genius!! And with Kaffe, it is gorgeous genius!! Thank you so much for the wonderful idea and the even more wonderful tutorial!! This is genius! Thanks for sharing -- I will be making one in the very near future. Super gute Anleitung, sehr gut bebildert. I love this thread catcher!! I am going to make some for my quilting friends as little gifts!! Thanks for sharing a tutorial!! Hi, I love this tutorial, thank you for sharing it. I am going to make one. And I too, love Kaffe fabrics. It will be beautiful. Can you tell me what keeps the little container from falling down, or just listing? I did not detect anything in the directions that would account for the catcher to be as stiff or straight as it appears to be. I just made one following the directions exactly and it does sit up straight without any interfacing or stabilizer. I used just a regular quilting cotton. What a wonderful idea and such a good tutorial in making it! I love the fact that it's a handy, portable size and will be so useful as well as simple to create! I've made several as gifts for my quilting/sewing friends. I did reinforce the ring by hot-glueing thin plastic strips to the inside and outside. It may be overkill - but those rims are really sturdy now! Tx for the tute!! I made one of these a couple of years ago the only difference from yours is that the directions called to use a small wooden embroidery hoop for the top rim. It makes a very sturdy edge and will last for a long time! They are very handy! Why not use one of those rubber bracelets everyone is wearing for the ring and a piece of plastic (milk carton, tracing plastic, etc. . .) that why they could be washed! Very fun, will have to give it a whirl. Just finished making my first thread catcher with your great tutorial. Not bad for the first time but I had a few glitches. My ring wouldn't fit inside the tube and I think I may have sewn the wrong ends together, the measurements are so close it's easy to mix up the long and short side, therefore, the tube around the circles was very tight and I had to snip the band inside so it would fit. In the end, it works but has a very tight fit. I wasn't sure what fabric to use and thought yours looked heavy so I used duck (?). That may also contribute to the tightness. The only thing I would want to see different on the tutorial is to use a thread that stands out more, my eyesight isn't what it used to be and had to strain to see the blue thread. Otherwise, great tutorial! I plan to make more of these. I have the pattern but have not made it yet thanks for any added hints that will make it easier for me to do. I also have the same iron and love it! How cute is that! Love the concept and execution. Perfect gift for sewing friends. I prefer written instructions to You Tube. Glad if found this page. Perfect instructions, step by step...Love it, thankyou so much. Hi I just post to ask you'll folks if I want to do this project but you don't have any Pringles container nor neither ringline whatever it is Or is called.What is the best substitute to do this project to make it collapsible(fabric bag; just asking. I look forward to making some of these soon. Would cardboard ring( I mean taking cardboard pieces & form in a circle) work also; just asking. I look forward to your reply as soon as possible. Thanks for sharing this tutorial btw. I made one yesterday using the inner ring of a small (4") embroidery hoop. Worked great! Sooooo cute but it appears to be involved. Brilliant ! I love your fabric by the way ! OMG! This tutorial is fantastic! So detailed. THANK YOU! Thanks yu fr yur pattern and how to do. I now have anther thing t make for my sewing friends.!!!!!!!!!!!!! Thanks for stopping by the quilt cave...I love your feedback! I am sorry, but you need a Google account/Profile to pose a question or leave a comment. That is very easy to get (FOR FREE) at Google.com. Of course, you can click on my email and contact me there any time! I am no longer able to accept comments from Anonymous readers...too much weird spam! ON SALE NOW! Original block patterns and block bundles for BALTIMORE RHAPSODY & LITTLE TREASURES! I have a Pinterest Account...so, I GET IT. If you wish to pin any images, please make sure you credit me and/or my blog...I'm pretty nice. The contents of this blog are my personal, creative mind droppings, therefore my personal property. 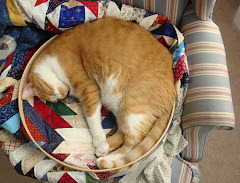 Weasley says, "No quilting today!" I'm a quilter, musician, wife, mother of a college sophmore, research biochemist (used-to-be), compulsive organizing freak, and a lover of all the history surrounding quilting. 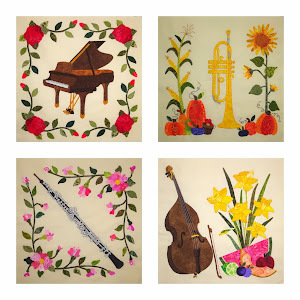 I am drawn to all forms of quilting, but particularly like to do hand applique and hand quilting, which I tend to approach with a wacky, weird sense of humor. After dabbling with pattern doodling, I'm offering some patterns for purchase through my online store (see the link above). I have recently returned to my state of origin after 25 years in the Midwest...wasn't really a Midwesterner, but not really a Southerner anymore...in limbo!